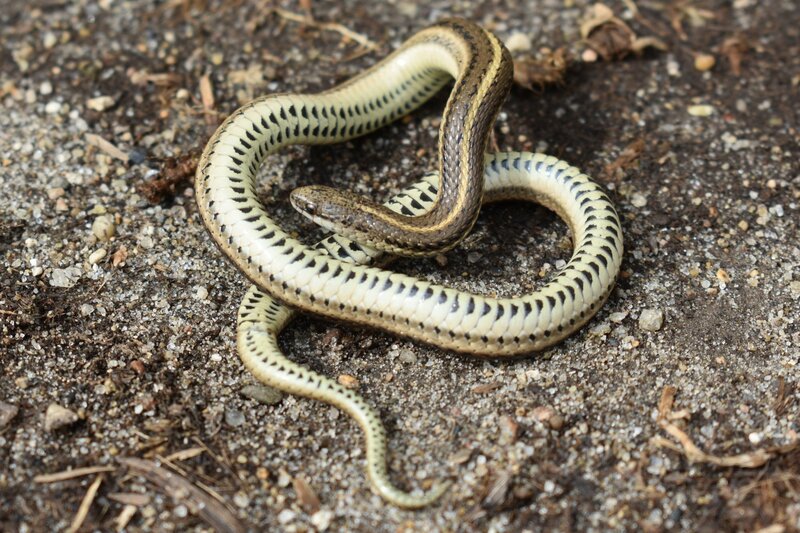 The Lined Snake (Tropidoclonion lineatum) is a small, state-endangered fossorial snake that is distributed across a large portion of the Great Plains. Populations of the Lined Snake span from southern Texas and reach their northern limit in southeastern South Dakota and southwestern Minnesota. 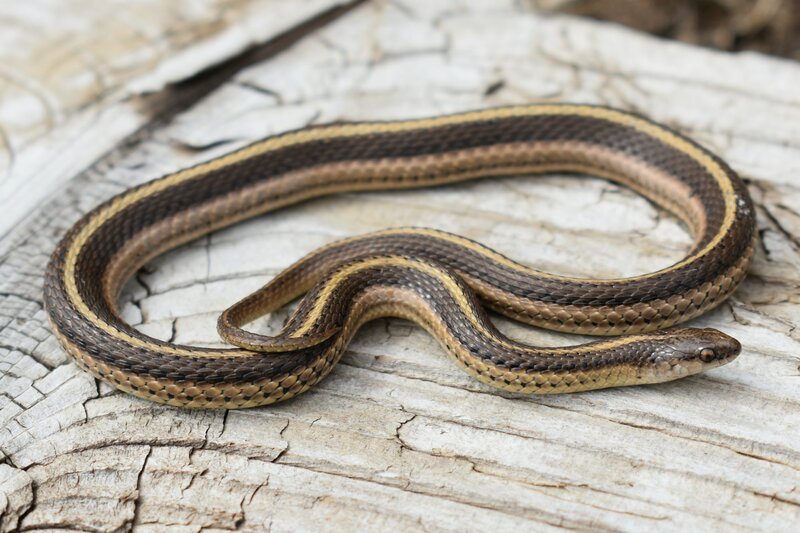 Within South Dakota, the Lined Snake was thought to occur only in habitats along the Big Sioux River watershed, until a specimen was collected near the James River in Hutchinson County in October 2017. This recently collected snake represents the most northwestern occurrence for this species, provides evidence that populations of Lined Snakes may exist outside of the Big Sioux River watershed, and suggests that the distribution of Lined Snakes in South Dakota may be greater than expected. To better understand the distribution and occurrence of Lined Snakes in southeastern South Dakota, a series of targeted surveys will be conducted for Lined Snakes along the lower James River Valley. HOW TO HELP: I am actively seeking observations of this species from throughout their range in southeastern South Dakota, but particularly from along the James River Valley. If you have photographs of this species, please submit them to www.sdherps.org/submit, use the Contact link below, or send an email to: drew.davis (at) utrgv.edu. Adult Lined Snake (left) and diagnostic half-moon patterning on the underside of Lined Snakes (right). 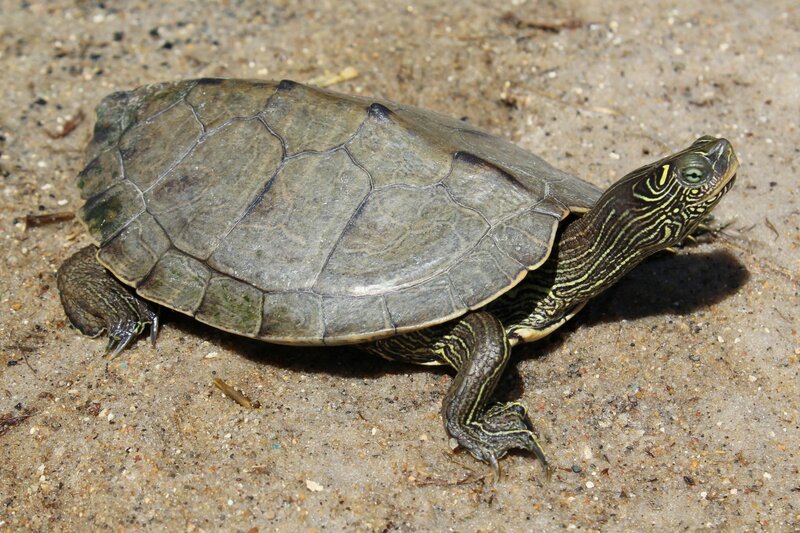 South Dakota Game, Fish and Parks has funded a two-year survey effort to examine whether the state-threatened False Map Turtle (Graptemys pseudogeographica) is still present in Lake Oahe, a large reservoir along the Missouri River, north of Pierre. Daming of the Missouri River and the formation of large reservoirs has resulted in habitat degradation and loss, and likely the extirpation of this species form a large part of their historic range. Initial results from 2017 suggest this species is extirpated from the main area of Lake Oahe; however, this species may still be present in the large river drainages on the western shore of Lake Oahe (Cheyenne River, Moreau River, Grand River). 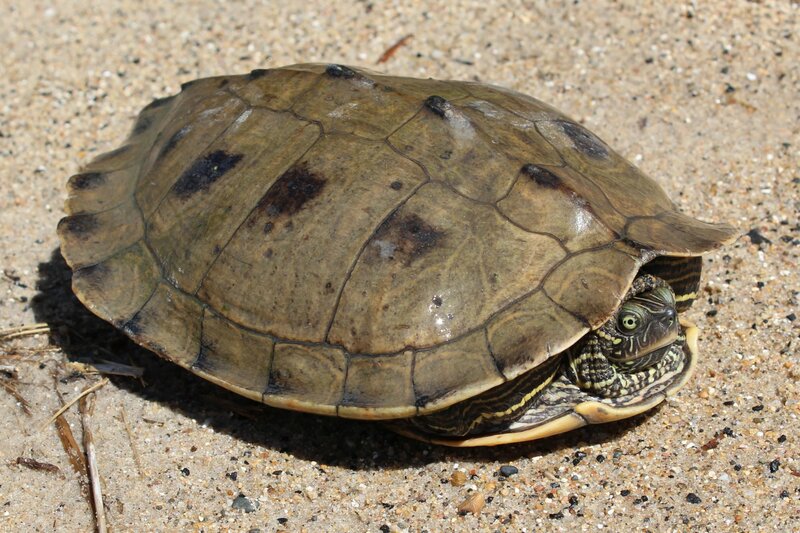 Despite its extirpation along most of Lake Oahe, False Map Turtles remain numerous from free-flowing, more natural segments of the Missouri River, such as the 59-mile Missouri National Recreational River from Yankton to Sioux City. HOW TO HELP: I am actively seeking observations of this species from throughout South Dakota, especially the Lake Oahe area. If you have photographs of this species, please submit them to www.sdherps.org/submit, use the Contact link below, or send an email to: drew.davis (at) utrgv.edu. Adult male (left) and female (right) False Map Turtles (Graptemys pseudogeographica). Resources for the general public concerning South Dakota amphibian and reptile species identification, distribution, and natural history are limited. Although a field guide on South Dakota amphibians and reptiles exists, most individuals use the internet to search for answers regarding species identification, natural history, and state distribution. Currently, no such information is available online and therefore, it is critical that a resource is developed. To address the need of having a user-friendly website with information on amphibians and reptiles of South Dakota, we have recently launched the website: www.sdherps.org. This web platform contains species accounts, distribution maps (based on over 11,400 vouchered specimen records[as of February 2017]), and photographs of all 45 species of amphibians and reptiles in South Dakota. Additionally, we aim to promote the submission of citizen-generated observations of amphibians and reptiles through this website and its partner, HerpMapper. The combination of a website devoted to South Dakota amphibians and reptiles, and increasing public submissions of field observations, will allow for us to provide a resource to the general public and generate occurrence data that can be used by researchers and South Dakota Game, Fish and Parks. HOW TO HELP: I am actively requesting observations of amphibians and reptiles from throughout South Dakota be submitted to www.sdherps.org/submit in order to continue to build the number of observations of which distributions maps created from. User-submitted observations of amphibians and reptiles from across South Dakota during 2017. Species from L to R: Western Tiger Salamander, Plains Spadefoot, Prairie Skink, Ring-necked Snake, Western Foxsnake. Please contact me with a short synopsis of your research projects to be added to this page.